Love these! Especially the gold & pink - so fun for summer! oh me oh my!! I absolutely LOVE them!!! Are these by Monika at BFREND?! They look so similar! Love them! Landi: No, these aren't. They're by lea hill. Oh they are tres cute. I saw an old post of you wearing one of these bracelets and I wondered where I would be able to get them... now I know where!!! Hi Jen, these are beautiful! I love all the bracelettes that you layer. I have been trying to contact you by email through your contact page but it will not work. Is there another way that I can contact you about a guest post? These are too good. Just too good. The gold and pink is amazing! OOOHHHH aaahhhh love them all! Can't wait to scoop one up! Those are amazing love it!!! love them! 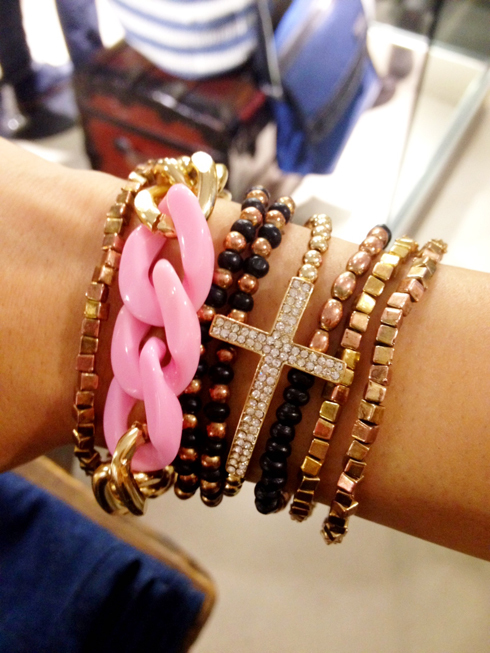 The black/gold and light pink/gold are my fave!!!!! Gold + Sparkly + Colorful = LOVE!